Contradiction: Spot the Liar! Is a full motion video (FMV) adventure/murder mystery game, developed by Pneuma Films and written/directed by Tim Follin. As a player, you take the role of Detective Inspector Frederick Jenks who is investigating the recent murder of student Kate Vine, in the quaint, fictional village of Edenton, London. I won’t say anymore, so I don’t spoil the absolute joy and satisfaction that comes with unraveling the tale of Kate’s demise. When I first started playing, I had no idea what I was in for. My knowledge of FMV games was limited to the Philips CD-i disappointment known as Link: The Faces of Evil and Zelda’s Adventure. So, I had little expectations. The scraps of feedback I had heard going into Contradiction: Spot the Liar!, however, ranged from “a must-see” to “it’s awfully hilarious”, so this was enough to spark my intrigue. 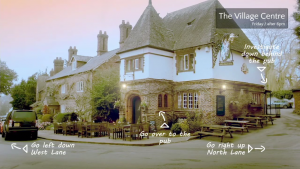 The game combines the real-life filming locations of Great Budworth, Cheshire, and the Mansion House in Victoria Park, St. Helens, Lancashire (both in the United Kingdom) to create the fictional backdrop of Edenton. You will become quite familiar with this cozy village as you discover new evidence or information, frequently questioning the suspects that inhabit it. The main points of interest are several cottages, the village pub, a farm, and the trail in the forest that will lead you to the Atlas business training center. Each location holds pieces of the story that will unfold as you progress through the mystery. 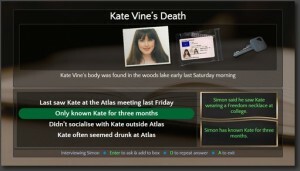 The Steam version of the game uses simple keyboard commands to move through the town and to interrogate your suspects. You will come across various pieces of evidence in Edenton, ranging from simplistic to outright hilarious. While you interrogate, it becomes clear this is where your true detective mastery will come into play. You will lap the village several times, questioning the citizens on your findings. Each time you acquire new information or items, these will be logged in your journal. As you review your journal, you must compare pieces of conversation to figure out who is trying to swindle you, and call them out on their lies. . If you get stuck, you can use the village’s payphone to call the Chief, who will suggest that you rethink things you may have missed. The addiction that will develop while you play is unavoidable. Just when you think you’ve got it figured out, the game will throw in the most unexpected twists. The different personalities of the citizens combined with Jenks’ campy delivery will provide you with constant entertainment. Contradiction – Spot the Liar! is well beyond worth the $9.99 it will cost you on Steam (or the $4.99 on iPad). This game is best played, as creator Tim Follin intended, with a group of friends or family so you can bask in its utter brilliance together. Do you happen to own THIS game? No? Buy it now! Listen to our interview with the game’s director Tim Follin!